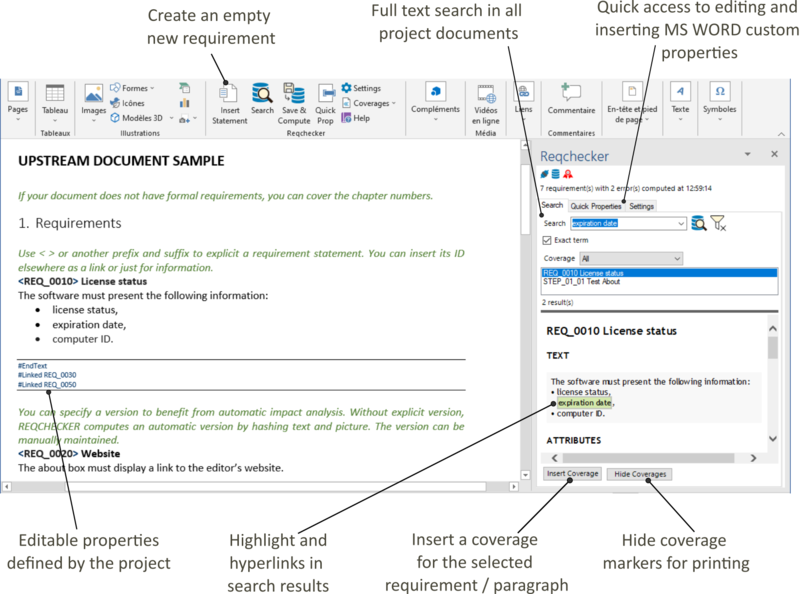 REQCHECKER™ add-in for Word add-in for Microsoft WORD provides powerful features for easily search, display, author and cover requirements directly in WORD application. REQCHECKER™ add-in for Word is free to use and compliant with REQCHECKER™ and REQCHECKER™ PRO. REQCHECKER™ add-in for Word is installed separately from REQCHECKER™. Installation instructions are available in REQCHECKER™ Install and REQCHECKER™ PRO Install pages. Click on Insertion ribbon section on the top of Microsoft WORD to display the REQCHECKER™ add-in for Word ribbon buttons. Insert Statement button inserts a new statement at the cursor position. Search buttons searches text in the requirements database. Save and Refresh button saves the current document and refreshes the database with latest changes. 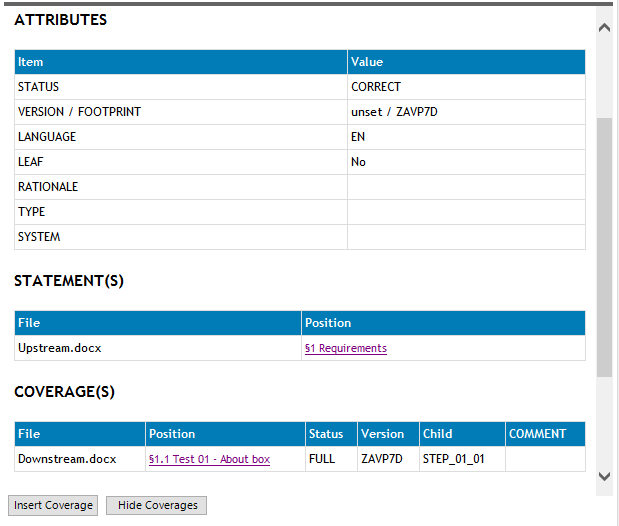 Hide / Show Coverages toggle button shows or hides coverage in the document. Settings button opens the Settings tab. This tab manages connexion settings and authoring settings. Icon section > connexion icon displays red or blue if REQCHECKER™ add-in for Word is unconnected or connected to REQCHECKER™ project. Icon section > database icon displays red or blue if requirements database is unavailable or available. Icon section > medal icon displays red or blue if project has error or is correct. Project section > Path text displays the connected project. REQCHECKER™ add-in for Word automatically connects to the running instance of REQCHECKER™. Project section > Open button opens the project at the latest path used for this document. Project section > Browse button selects the project path and opens it. The path is saved for next connexion. Statements section > Insert bounding box check-box enables / disables the insertion of a grey bounding box to enclose new requirements. 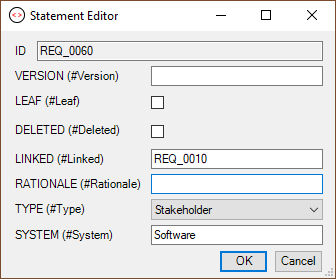 Statements section > Insert WORD fields check-box enables / disables the insertion fields (content controls) for new requirement. Statements section > ID template text edits the ID syntax for new requirement. Statements section > Next ID text edits the next ID numeric value for new requirement. Statements section > ID increment text edits the ID increment value for new requirement. The top of the search tab includes a full text search engine on title, text and custom attributes. Search in database bar edits the terms to find. Several terms are linked by a "AND" logical operator. Search button runs the search. Another way to run search is to press Enter key from the search bar, or to right-click on a selected word directly from the document. Clear Search button clears the search settings and displays all requirements. Exact term check-box limits the search to the exact value of the search bar. Space characters can be included. Coverage drop-down list filter the results on a specific coverage status or error. Results list display all requirements found. When a requirement is selected in the search results, its content is displayed on the bottom of the search tab. The viewer displays all information and attributes. The searched terms are highlighted. The hyper-links open the target in its original document. The viewer area can be resized with the grey horizontal grip line. Insert Statement button in the ribbon menu inserts a new statement at the cursor position. The GUI edits the initial values for attributes. 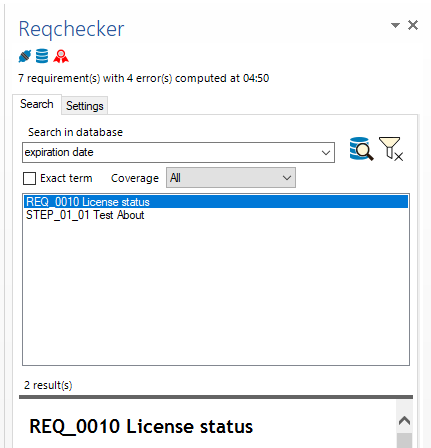 With REQCHECKER™, version value is not mandatory. An automatic version (footprint) is computed for you if you leave the version empty. 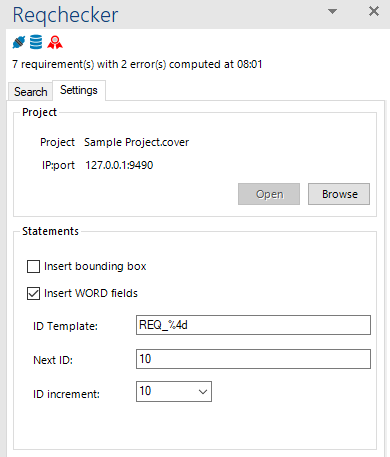 If the Insert WORD fields option is checked, the syntax of the requirement ID is checked against the project syntax when the control is exited. Note that other kind of errors (e.g. duplicate ID) requires all documents together. They are computed with the Save and Refresh button. Insert Coverage button at the bottom of the viewer inserts a new coverage of the selected requirement at the cursor position.